Earn 20 SATVantage Rewards points with this purchase! 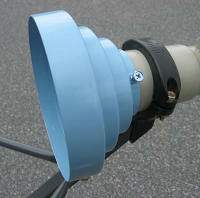 The BSC-Conical Scalar from DMS intenational is an scalar ring for offset satellite dish antennas. Use this Conical Scalar on the BSC421 or similar with a 90cm offset dish or larger to received C-band signals from the strong C-band satellites.